In recent years there has been a noticeable increase in awareness that the air we breathe may not be as pure as we would like. Soldiers in the trenches between 1914 and 1918 suffered the most appalling attacks of mustard gas and other agents, making the use of respiratory protection such as gas masks critical for their survival. Not wearing this protection would have resulted in reduced quality of life and in many cases death. Sadly, these attacks came with little warning, and to add to the misery the protection was not only rudimentary, it also dramatically reduced soldiers ability to perform basic activities - let alone defend their positions in the trenches. Since those dark days of the first world war, developing industrial countries around the world have sought to improve our quality of life through innovation and technology, taking us from a relatively sedate way of life to one of sophistication driven by the desire to develop. The dependency on oil has been responsible for much of our creative activity, and in turn has on more than one occasion taken us to war. In the 1960s and beyond into the following decade the threat of nuclear and biological warfare galvanised the continued creation of further technical solutions for the protection of the military. The other war faced by industrial activity was the protection of the millions of workers who themselves were subjected to all manner of threats in their respective working environments. Unlike the aforementioned rigours of the military, however, industry had plenty of warning - there was no sudden change to the environment. Added to this was the responsibility of the employers to ensure they were not subjecting their employees to attack from the activity of work. This recognition of responsibility has, over recent years, been underpinned in the UK by our membership to the EU and the resulting legislation that has now become common within our workplaces. Words and sound bites such as compliant, duty of care, fit for purpose and risk assessment are now in our everyday vocabulary, although these changes alone have again a need to be reinforced with possible litigation, corporate homicide and corporate manslaughter. The UK’s Health and Safety Executive (HSE) is in place to ensure employers are responsible and that unlike the Armed Forces workers, are not in highly hazardous environments. The quality of protection, including personal protective equipment (PPE) available to workers in all areas of industry is now better than it has ever been. From workers in the food processing industry to the emergency services and through to agriculture, compliance is critical, and both employers and employees have their part to play to ensure the working day is safe. All areas of the body have to be considered when assessing what risk an employee is working with and in the past forty years PPE manufactures have risen to the challenge. This multi-million dollar industry has created the most comprehensive range of products and equipment to satisfy all environments and to protect the eyes, ears, head, lungs, hands, feet, skin and of course, the torso. One area that is still very much at risk despite innovation, however, is the respiratory tract. "the war against workplace hazards was not over and there were more battles to fight"
Working with asbestos is always seen as the pinnacle of danger - the worst of the worst. More recently, however, the PPE industry has been challenged to find even greater levels of protection for these new demands. The war against workplace hazards was not over and there were more battles to fight. Industry had, under its duty of care, identified new enemies. Many of the threats to the lungs of the labour force had, in the past, been regarded as low risk. As such they were addressed with relatively simple filter devices that were compliant with the certification needed in relation to the identified application and risk. The newly identified threats, however, were arising for data built up over many years: ex-employees were starting to experience problems in their retirements - and not just the normal suspects. The modern day manufacturing processes employed new technologies and materials, which when worked emitted pollution into the local environment that had not been seen before, in particular when welding. The relatively low cost filter mask in use at the time needed reviewing and it was identified that new filters and re-engineered technology was needed. Where possible employees were introduced to power assisted air supply. This came in two forms: airline fed from an in-house filtered supply system, or when in remote locations, powered air purifying respirator (PAPR). The filtering was conducted within the power pack worn by the worker, in the form of a battery powered waist pack. In the case of the welder, the air from the power pack was delivered via an insulated hose to the back of the welding helmet, through a duct situated directly above the face of the wearer. The air was then exhausted past the chin and into an open space. In the case of some helmets additional protection came in the form of a face seal, which was a fire retardant fabric fixed to the chin area of the helmet and held close to the throat by an adjustable cord. To accommodate various working applications and improve safety these PAPR units are now available with adjustable speeds, as well as audible and visual alarms for when either the battery is low or the filter needs changing. When worn with other items these latest offerings protect against the risks faced. Heat and fumes in particular are seen as the latest threat, and the PPE industry has responded accordingly. It is only a matter of time before respiratory protection will be a legal requirement and all welders will have the benefit of air protection. From the turn of the last century asbestos was the first choice for applications across many areas of the developing world. In its three major forms of blue, brown and white, from the 1930s to the 1960s asbestos’ applications varied from insulation and roof sheeting, to use for car brake shoes. This begs the question: How much asbestos dust was blasted into the high street before it was discovered as the silent killer we know it to be today? The use of asbestos is now banned in many countries across the world, this took effect from the mid 1980s. White, brown and blue asbestos were used in massive quantities in the construction industry for the same reason as they were employed in brake shoes: asbestos’ ability to provide a fire resistant interface and in doing so provide effective insulation. When mixed with cement, many agricultural and industrial buildings were protected from the elements with corrugated roof sheets, which were drilled onto the upper profile and fixed to the purlins of the structure with hook or crook bolts. To do so each hole would have been drilled on site, with the other members of the site work force directly below. Thankfully the asbestos used in the roofing materials discussed was made using the lesser of the three evils, white asbestos. The use of deadly brown and blue was generally reserved for insulation and lagging of pipework and ducting. The real worry, however, was the use of blue asbestos, which in the last 30 years has been identified as the real potential threat to health via the respiratory tract. Inhaling even a small amount has shown to start lung cancer for those who have worked with it in the past or have been unfortunate enough to inhale it passively. A single fibre can cause a chain reaction leading to laryngeal cancer, fully established lung cancer and premature death. Some of these materials were used as late as the 1970s. As the identity of these dangerous killers was made clear, developed countries around the world set about trying to find effective ways to remove wherever possible all forms of asbestos. This was seen from the outset as a very risky business, as after safe removal followed the question of what to do with the asbestos once removed. With the combined resources of health and safety organisations around the world and expertise from the PPE manufacturing industry a number of solutions were created. The primary solution was to provide respiratory protection to specialist workers who were licensed to remove and replace these dangerous materials. The cost of removal is high, and once contaminated PPE cannot be recycled, so not unlike when handling nuclear waste, the PPE is disposed of too. There are numerous designs and models of masks available, but as with all forms of PPE when used in these critical applications, the respiratory protection forms only part of an ensemble. It has to be compatible with other components in the attire, which include protection for the eyes, ears, hands, feet and torso – as one fibre is all it takes. Welding fumes exposure in the work place is a serious hazard, in particular, when working with welding rods containing manganese. During recent years thousands of welders have sought litigation against welding rod manufacturers. The manganese in the rods creates a number of very serious illnesses, including the possible onset of Parkinson’s disease. Investigations are on going to see if there is correlation between manganese and the onset of Parkinson’s, as the number of welders with symptoms of the disease is alarmingly high. Welding fumes are generated by the fusing of two pieces of metal via the welding rod, which generates intense heat between the pieces of metal. The rods produce molten filler, which as a by-product creates small particles that are driven upwards in the welding fumes by the heat of the operation - directly into the face area of the welder. In confined areas such as workshops this could also spread to any non-welders nearby. The fumes created by the welding process can vary in content and are influenced by the work piece, the coatings and the heat levels generated. The mixture of metals contained in welding fumes is alarming and can include cadmium, chrome copper, lead, and vanadium. Within the plume there are gases that contain carbon monoxide and nitrogen oxide, all of which are known to be damaging to health and under any other circumstances they would be avoided. Welders are without doubt in a high risk environment and unless they are wearing the correct PPE will be inhaling these poisons. The particles enter the bloodstream via the lungs and then travel to the brain and other vital organs. The concerns surrounding manganese poisoning are by no means a problem of this century. As far back as the 1930s, workers – in particular welders – were aware of risks surrounding the use of this component in welding rods. In 1963, toxicologist Dr Irving Sax published findings on how damaging electric arc welding with manganese was to the health of welders, in particular its affects on the nervous system. In 1981 the World Health Organization (WHO) reinforced these findings, again endorsing the use of a PPE system that would protect the lungs and other organs from this threat during welding. There are more than 12,000 cases in the US where both former and current welders either with symptoms of Parkinson’s disease or who are starting to feel unwell have taken their case to the law courts. These workers have in some cases successfully sued welding rod manufacturers - one received a one million dollar settlement for negligence leading to manganese induced Parkinson’s as a result of breathing rod fumes. It is noted that a number of cases are still in court and are being supported by a number of senior judges. In the US all welders and their employers are made aware of, read and understand ANSI Z49.1, with a copy available in the workplace. In the UK the responsibility is with the employer under duty of care, and is there to ensure the PPE supplied is fit for purpose, along with the materials supplied to conduct a days work. It is also the responsibility of the employer to ensure the PPE supplied is in good working order and is subject to a sustainable inspection and maintenance programme, and of course to provide training for the use of PPE. 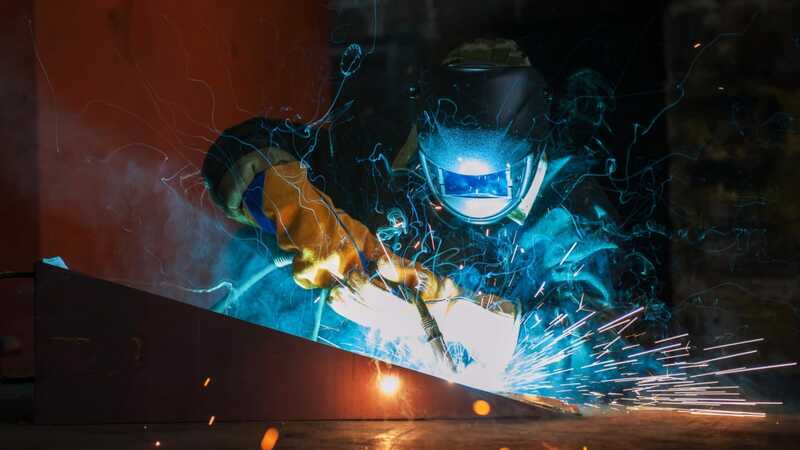 It is the employer’s responsibility to ensure all the necessary risk assessments are conducted and all aspects of the welding operations have been accounted for, from the materials used to the equipment employed. The legislation surrounding the use of respirators has yet to be enforced by law, but with so much in the way of evidence now available it is only a matter time before all welders - and those in equally challenging environments - are protected.